Twitter is an online news and social networking service where users are limited to 140 characters per message “tweet”. Both registered and unregistered users can view tweets, but only registered users can post. Twitter was created in March 2006 by Jack Dorsey, Noah Glass, Biz Stone and Evan Williams. Twitter gained worldwide popularity and in 2017, has 212 million monthly users. Dorsey originally imagined Twitter as an short message service (SMS) communication platform where friends kept tabs on each other based on their status updates. Similar to texting, but free. Today, Twitter's Mission statement is "To give everyone the power to create and share ideas and information instantly, without barriers." However, Twitter has evolved immensely from its original purpose. Twitter is accessed online at Twitter.com or through its mobile apps for iphone, ipad, and Android. Twitter has customizable profile page. Users can have profile pictures, banners, background images and control the color of the twitter homepage under their user settings. Users have the ability to create "tweets" or small posts consisting of 140-character count. Tweets are public and searchable. With tweets users are able to 'retweet' or 'like' another users tweets. Since twitter is a social media network it focuses on 'followers'. Followers twitter users who have the selected the option of 'following' other Twitter users. By following another user, users are able to see that users profile (including personal information), other followers, people who they follow, tweets and videos/images. Users can include the "@" sign followed by a username is used for mentioning or replying to other users tweets. Users are also able to ‘protect’ their tweets; meaning users can make their page private to any users who don’t following that user. When tweets are protected users are able to accept or decline a followers request. Users have the ability to "like" a tweet by tapping the heart icon on a tweet. The "like" option is the is a simple way to acknowledge a tweet. 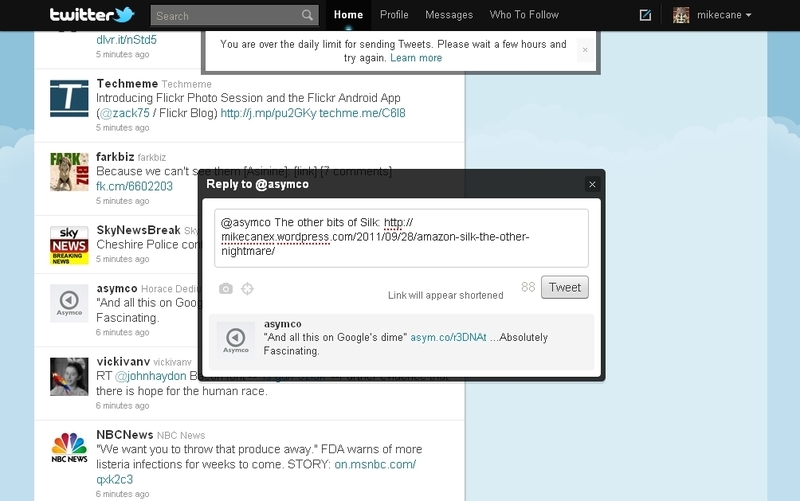 It is also a way to bookmark the tweet, so a user can find it later. Tweets offer a "reply" option, that allows followers to directly respond to a tweet. Unlike tweets, messages are private. Users have the ability to send private messages to their followers. With Twitter's latest update, users can now receive direct messages from anyone even those who do not followers of a user. 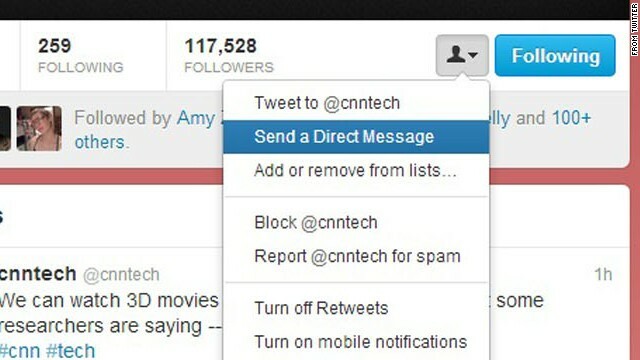 When using Twitter's Direct Message option, users are able to delete messages that he or she sent to another user. User may delete a message in their message thread even if the other user has already seen the message. Direct message acts as a thread message on twitter. Twitter provides users with a search bar on all devices. The search bar is located on the top of the desktop device. For apple devices the search bar is labelled "explore". For androids devices the search bar is a magnifying glass icon. The importance of a search bar is so that users can search for other users and also search for tweets. To search for other users simply add the "@' symbol in front of the users name. To search tweets simply add a hashtag, "#", in front of the topic. Users do not have to have a Twiiter account in order to use Twitter's search bar. Users can combine similar topics by adding a hashtag in front of the word or phrase. To have a trending topic or to ‘trend’ is to have a topic that incorporates a hashtag, “#”, at the beginning of the topic and to be able to have a large amount of followers re-tweeting or tweeting including the hashtag. There must be no spaces between any of the characters for the hashtag to work successfully. Trending is when topics gain above average mentions in a short amount of time. Twitter allows ten top trending topics based off of a user location. Users are about to tailor their location so that they only see tweets and trends that are in their area. Twitter's trending rate differs depending on the hour in real life time. So during certain hours it is easier to trend. Once a user starts trending, they are able to go to the search engine and see all tweets that incorporated with a related hashtag. Using hashtags is important on Twitter for users to be able to follow the latest and most popular news or topic. Hashtags also make categorizing tweets much easier. 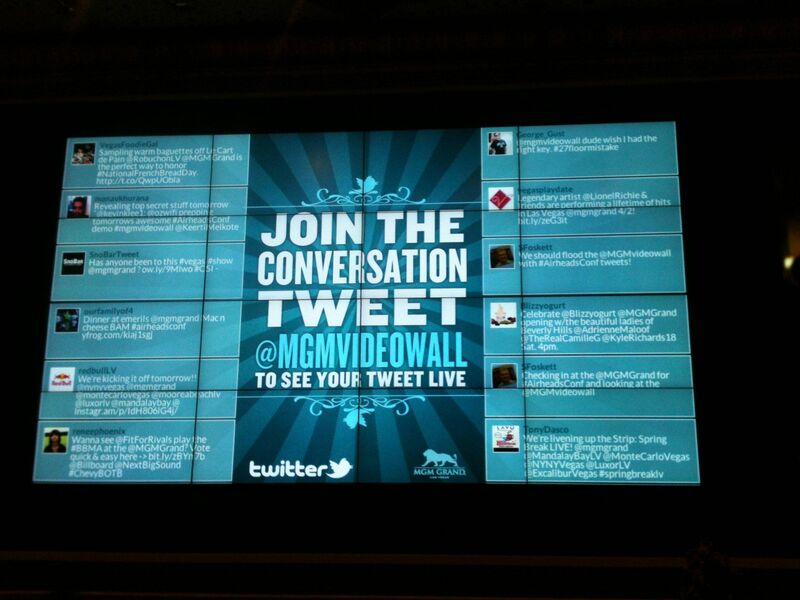 A Live Tweet is a tweet by a user that is broadcasted while the show is on air. Twitter released an internal study that found networks and studios that live tweet during the airing of an episode can boost followers and Twitter mentions. Networks and users posting from a show’s Twitter handle, like @bigbangtheory or @TheWalkingDead, can increase Twitter conversations by 7 percent during the show. Twitter said that having the show’s cast members live-tweet is even better, with an increase in tweets by 64 percent. Twitter evolved this function to fit online formats as well. At comic conventions, most panels are streamed online and onto bigger screens. The screens project the panel and live tweets from audience members. When a user is in Twitter Jail he or she may not tweet or re-tweet. Users are able to have access to their page and can view other user’s pages but can’t re-tweet or interact with others. Twitter jail lasts for 1 to 3 hours. Twitter jail was created to stop users from mass tweeting other users as a spam campaign. It was also created as a safety feature to protect users from scale hacks and threats. There have been articles about users finding ways to get out of Twitter Jail such as having multiple other users tweet the user's twitter name in multiple tweets. But none of these have been proven successful. Users can visit the Twitter Support page if and when they have technical issues with their account. On the support page users are able to search various issues and get possible solutions. Twitter Support also has a section where users can learn how to use twitter and to get the best experience of the site. Click here to review that article. The article discusses various ways on how users can make the most of their experience. The article also provides instructions on the various ways twitter can be used. Twitter has developed a way for other companies to connect to its users. To see learn more about authorizing an application twitter has an article. Twitter recently included a function where users can monitor the devices connected to an account. By monitoring user's account users are able to see when and where someone accesses their account. users are also able to manage the devices that have access to their account. Twitter has the option to “advertise with twitter”. Tweets that are labeled "promoted" are paid advertisement content. The promoted content that appears on a Twitter account is customized by Twitter analytics, when users follow, Tweet, search, view, or interact with Tweets or Twitter accounts. Twitter offers its users the option to not see ads for free. Under Twitter's "Manage Your Privacy Settings" in the Twitter's Troubleshooting and FAQ section of Twitter's Advertising and Business website. Twitter has about 313 million monthly users. According to PewResearch Center2 about 1/4 of online adults use Twitter. Younger Americans (aged 18-29) are more likely to use Twitter than older Americans. 29% of the Twitter users are obtaining or hold higher educational degrees, which is a higher percentage than other social media users. Twitter has a terms of service PDF available for free download here. Twitter was the thing influenced when it came to user behavior and interface. Users began creating new and different ways to use Twitter. When Twitter didn’t have the option of replying or tagging a person in a tweet, users began using the @ symbol before their user name to identify another users within a tweet. Twitter later added this functionality to their platform. Hashtags are another example of users using symbols to connect words or phrases. Retweets were also created from users that wanted to repost a tweet from a Twitter user while including credit to the user who originally wrote the tweet. Before retweeting was an option, users used to add “RT” before quoting the tweet they posted. When Twitter’s user base, continued to grow it transformed the way users find out about important uses and how they take action on them. Fei Xiong and Yun Liu, professors at Beijing Jiaotong University who gathered and analyzed the data about public opinion on Twitter. The Study4 revealed that public opinion on Twitter evolves rapidly and levels off quickly into an ordered state in which one opinion remains dominant. This consensus is often driven by the endorsements of larger groups, which have the most influence. The work also revealed that when dominant opinions emerge, they do not to achieve complete consensus. Twitter users who hold minority views are not likely to change their opinions. Xiong and Liu also revealed that Twitter users are more likely to try and change the opinions of others than to admit to changes of their own. Twitter wants to be a community of sharing thoughts, pictures, videos and other links. Twitter is constantly reminding its users that any user can send a tweet, which is public by default. They even use the tag line, “You are what you Tweet!”5 in hopes of reminding users that others are reading what they are writing or sharing in an attempt to keep the community friendly. However, this is not always the case. Twitter, like most social media platforms, have taken steps to prevent cyber abuse. This includes putting a “Report abusive or harassing behavior”6 report. The report is found in the Help Center options and is for users to file a report on someone who is harassing a user with specific violent threats involving physical safety or well-being, exposed private information or photo, someone on Twitter is posting spam, or directs hate against a race, gender, religion, or orientation. Twitter, unlike other forms of social media, is considered slow to respond to bad and abusive behavior towards its users. So far, the only known publicly and permanently banned user is Milo Yiannopoulos. When Twitter does act to remove an abusive user, it is only after sustained public outcry and multiple reports being filed. And even then, abusive Twitter users have only been temporarily banned before their accounts got reinstated. We know many people believe we have not done enough to curb this type of behavior on Twitter. We agree. We are continuing to invest heavily in improving our tools and enforcement systems to better allow us to identify and take faster action on abuse as it’s happening and prevent repeat offenders. We have been in the process of reviewing our hateful conduct policy to prohibit additional types of abusive behavior and allow more types of reporting, with the goal of reducing the burden on the person being targeted. We’ll provide more details on those changes in the coming weeks."